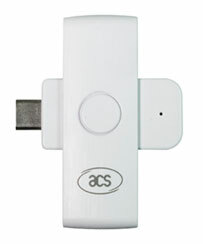 The ACR39U-NF USB-C Pocketmate II from ACS is a pocket-sized contact smartcard reader that swivels to reveal the contact slot for a full sized smartcard. Featuring the new ACR39 chipset and a USB C connector, this reader is suitable for various computer and mobile-based smartcard applications. PC/SC and CCID compliant, the ACR39U-NF supports Windows, Linux and Mac and can easily be integrated with any Android mobile device running versions 3.1 and above. The ACR39U-NF is a powerful smartcard reader that houses the ACR39 core in a highly portable case. This reader offers a convenient and security-conscious solution to various applications including PKI authentication.